Hi, currently in Jerusalem so blogging is going slow right now. However, I plan to post a link to a new Youtube channel tomorrow evening with video clips I will film which I think people will find interesting. I'm spending my time during this particular trip here in Jerusalem, the Dead Sea valley, the Golan and northern Israel (Syrian and Lebanese borders), and parts of the coastal strip. I'll be uploading clips (internet connection permitting) each evening and will organise Youtube settings so anyone subscribing will receive notification each time I post a video clip. My aim is to post brief clips (typically 30-90 secs) which move beyond tourist stuff to offer insight into the topography, history, culture, everyday politics and aspects of the theology of the land. The aim is a series of brief snapshots for those wanting to know more about this part of the world. I hope you enjoy it. More late tomorrow evening. I've now created a YouTube channel www.youtube.com/calvinsmithvideos. There are some clips uploaded already, with many more to follow over the next few days. You can comment on videos, and if you subscribe to my YouTube channel I think you're notified automatically whenever I upload a new video clip (if any veteran YouTubers know othewise or have additional advice please do post details here). 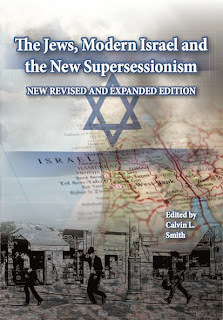 Since the TV debate on the Church and Israel we've received requests for the little book I edited in 2009 entitled The Jews, Modern Israel and the New Supercessionism: Resources for Christians. Unfortunately it is currently out of print. However, because there were five print runs and copies were ordered by various booksellers, I believe the odd copy is still available through some organisations (e.g. CFI) and smaller independent booksellers (possibly through Amazon). The book is currently being revised and several new chapters added (including one by Ron Diprose, author of Israel and the Church). I expect it to be published in the first half of 2012. The following is a guest post by Chris Lazenby in response to the documentary The End of God? aired on BB4 on 10 November. Ninety-minute debate between Stephen Sizer and Calvin Smith, broadcast live by Revelation TV on 9 November 2011. Has the Church Replaced Israel? (TV debate) from Calvin Smith on Vimeo. So Nicaraguan leader and former Sandinista guerrilla Daniel Ortega has just secured another term as President (despite the constitution barring it). Ortega, of course, was one of the nine Sandinista comandantes during the 1979-90 revolutionary period. Ousted in 1990, after which the Sandinistas ominously vowed to "rule from below", Ortega made a remarkable comeback some years ago and has retained and strengthened his grip on power ever since. I've previously posted on some of the issues contributing to diverse expressions of Messianic Judaism (MJ, also Messianic Jews), for example MJ self-identity as both Jewish and Christian, the movement's relationship with (and role within) the wider Church, and Torah observance. I'm particularly concerned at how vociferous anti-Israel sentiment within segments of Evangelicalism further complicate Messianic Jewish self-identity as believers in Jesus, together with their relationship with the Church. It can't be very easy to identify oneself as both a Jew and a believer in Jesus while some in the Church openly and systematically demonise Israel (flatly refusing to see both sides of the story). Furthermore, it makes it so much harder for a Messianic believer to share his or her faith with another Jew if what is being offered is inclusion within a body which is critical and polemically one-sided in the current Middle East conflict. That the Church has a long history of anti-Semitism only compounds that point. Thus Messianic believers are increasingly alarmed by some of the extreme rhetoric emanating from within parts of the Church. There is considerable disquiet at the harm it is causing MJ-Gentile Christian relations, together with MJ efforts to evangelise the Jewish people. There is growing criticism, too, of how some MJs are dialoguing with anti-Israel Christians, for example through the forthcoming Christ at the Checkpoint. An open letter posted yesterday to Messianic leaders and congregations raises this very point. It provides some insight into how the movement is feels under siege and seeks to respond to the current anti-Israel rhetoric and activism evident within Evangelicalism. Today the issue of social justice is increasingly discussed by Evangelicals who ask whether or not it represents an essential aspect of the Church's mission. Christian Post reports on a debate between Albert Mohler and Jim Wallis on this very issue, recently held at Trinity Evangelical Divinity School, Illinois. One issue arising out of the debate appears to be the fundamental importance of defining terminology. What, for example, does social justice mean exactly? For some it quite clearly represents a whole political ideology, for others it is a much more fluid and broad term. Whatever your view, the recently held debate (and comments posted by bloggers following the Christian Post story) demonstrates the need to define terminology before getting involved in debating issues. Further details of the debate can be found here.